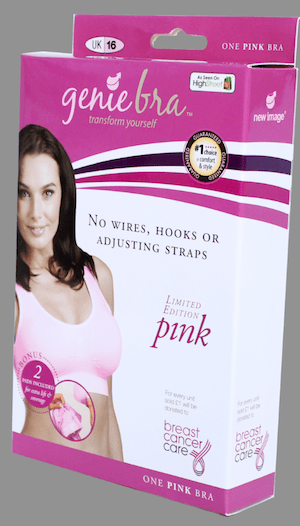 New Image Genie Bra, probably the most comfty bra on the market is once again partnering with the charity Breast Cancer Care to support Breast Cancer Awareness Month this October. The New Image Genie Bra is available now from all Bhs stores priced at £9.99. Throughout 2013, for every pink Genie Bra sold, £1 will be donated to Breast Cancer Care to help support women who have or are worried about breast cancer. Available in a special Breast Cancer Care ‘pink’ this charity bra has been developed for comfort and ultimate support. Designed to slim, smooth the shape and accentuate the bust line it will leave you looking the best you can look. So super comfortable, the New Image Genie Bra is now tried and trusted, and recommended by many Breast Cancer patients who’ve found it a perfect post operative bra and comfortable to wear over scars. Over 50,000 people in the UK are diagnosed with breast cancer each year – that’s one person every ten minutes –Breast Cancer Care aims to be there for anyone affected. Specially manufactured on a rare Santoni Seamless weave machine, the New Image Genie Bra will guarantee to rid the wearer of bust spillage and back fat – with no wires, hooks or adjusting straps in sight! It will give you as much support and uplift as a traditional underwired bra without digging into your skin, leaving you feeling comfortable and looking great. Fabulous for women of all shapes and sizes (no need to measure cup sizes, just pick your standard UK dress size (12 – 18), this clever bra is designed to move with your figure but will never stretch out of shape like traditional bras and its seamless design will mould to your cup size to give you a shapelier, lifted look. Money raised throughout 2013 will be used to support Breast Cancer Care’s freephone helpline, online forums and face to face services for anyone affected by breast cancer. The New Image Genie Bra £9.99 (in a special Breast Cancer Care pink shade) is available now from Bhs. Or you can also buy direct from www.geniebra.co.uk or freephone 0800 883 0314.